Sliding windows are a great option for any room in your home but are often found in kitchens, family rooms, bathrooms and living rooms. Think of them like a double hung window that’s flipped on its side. There are many customizable options with a sliding window. They can have one operating sash and one fixed sash or two operating sashes for more control over air circulation. There’s no window style easier to operate than a sliding window. Since they open and close on a sliding track, they can be moved with the push of a single finger. They’re very similar to a smaller sliding patio door. 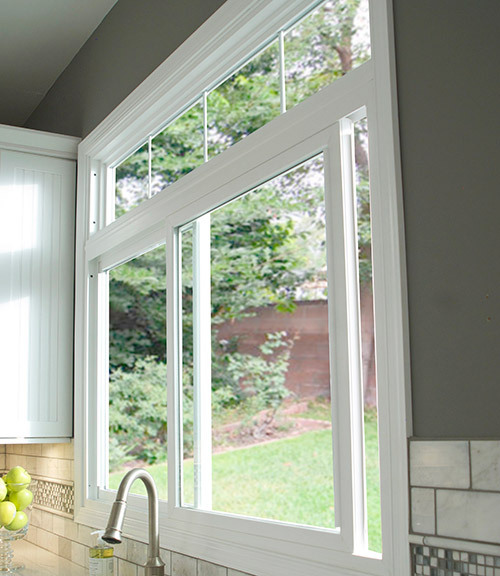 Sliding windows are often found in hard to reach places like behind a sink or couch because they’re so easy to operate. That way, you can open them easily without having to struggle with lifting them or using a crank. Feldco sliding windows have double pane, argon gas-filled glass and foam insulated frames to protect your home from Madison’s weather. Our windows keep out drafts while trapping your heated and cooled air so your home remains comfortable no matter the temperature outside. Not only that, but you’ll save money on your energy bills thanks to our sliding windows. This is because your furnace and air conditioner won’t have to use as much power to reach your desired temperature. Like our double hung windows, there are child safety latches on our sliding windows. These are found at 3 and 5 inches and prevent the window from opening too far. You can enjoy the fresh air without having to worry about your pets or children getting out. Also, similar to the double hung and casement windows, sliding windows are very easy to clean. All you’ll need to do is remove the sash which is as easy and lifting up and pulling out. You’ll be able to clean both sides of your sliding window from inside your home. Finding a trustworthy company for your sliding window installation is imperative. Look no further than Feldco. All of our windows are installed by factory trained and certified professionals. Rest easy with your replacement window project by getting a free quote from Feldco now.